To put it simply, an FHA loan is insured by the federal government. The FHA, or Federal Housing Administration, doesn’t issue the loans directly. However, it does offer mortgage insurance, which simplifies the process necessary for a lender to approve a loan when you’re buying a house. FHA lending guidelines are more flexible compared to a conventional loan. There are two primary perks of an FHA loan which make it a popular funding option for first-time homebuyers. First, an FHA loan will help you earn a lower down payment when it comes time to close on the house. According to Marcie Geffner, contributor with Bankrate.com, FHA loans require a minimum down payment of just 3.5 percent of the property price. Second, you can qualify for an FHA loan even with a lower FICO score. So, if you have poor credit, a foreclosure or a bankruptcy event in your credit history, going with an FHA loan is the better option than a conventional loan. Per the Federal Housing Administration, you must have a FICO score of 580 or higher to qualify for a down payment of 3.5 percent. 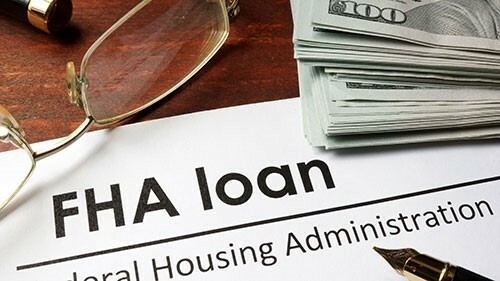 If your score is lower than 580, you can still qualify for an FHA loan, but your down payment will be higher — 10 percent of the home’s purchase price. As with any type of loan, the FHA system requires you to meet a certain number of criteria, according to Hal M. Bundrick, CFP and contributor to Nerdwallet.com. Depending on which state the property you’re buying is located in, the property must meet the FHA geographic loan limit for that state. For 2018, the limit for a high-cost area is $679,650. For a low-cost area the limit was $294,515. FHA loan criteria also apply to the house that you’re purchasing. The property must be a primary residence, which means a rental property or second home wouldn’t qualify for an FHA loan. The house also can’t be one that you intend to fix-up and resell. A strict inspection is required to appraise the value of the home and make sure it adheres to minimum property standards. Lastly, you have to obtain a title to the property in your own name or the name of a living trust at the time of settlement, and then occupy the house within 60 days after closing. There are also income requirements for FHA loans. First, you have to have a minimum of two credit accounts. You also must account for cash gifts from a family member or relative that help cover a percentage of the down payment. The loan requirements also stipulate that you must have no delinquent federal judgments or debts. Finally, to be eligible for an FHA loan, you have to have a certain debt-to-income ratio of 50 percent or less. This includes credit cards, student loans, the monthly payment amounts of the new mortgage and your monthly bills. FHA loans are a great choice if you have a less-than-stellar credit score and you desire a low down payment at the time of closing. Talk to your lender to find out more about this unique type of loan.